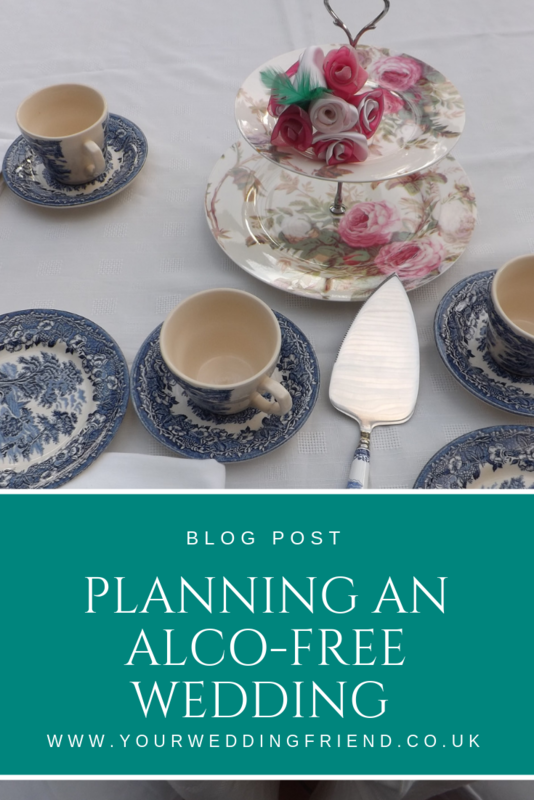 Whether you want to Go Sober for October, or are planning a teetotal/Dry January wedding, or if you'd just like to avoid any drunkenness but still want to have a great wedding day, this blog is for you. I'll look at ways to replace the usual alcoholic drink parts of most weddings along with tips on how to approach it with your guests. It can seem like most family wedding stories involve some sort of alcohol fuelled moment of madness; there's a reason Peter Kay's drunken 'uncle Nobhead' resonates with so many people. If the idea of your family/friends and alcohol fill you with dread, know that you are not alone. There are steps you can take to avoid the whole problem in the first place: have an alcohol-free wedding. First up, how do you approach this with family and friends? One way is not to draw too much attention to it, replace the alcohol with non-alcoholic drinks and let them figure it out for themselves. Another is to explain in your invitations that you've made the decision to go alco-free and you'd very much appreciate everyone's understanding. The second one opens conversation about why you've made the decision and unless you're prepared to answer those awkward questions I'd avoid this approach. I like the idea of just swapping out alcoholic drinks for alco-free ones. A hot drink station always goes down well with an older crowd and a juice bar is great for families. I've worked on a few weddings where rather than having fizz post ceremony we offered tea, coffee or juice. This worked well with them and no-one commented on why there was no booze. Another wedding went for lots of different flavoured juices, still served in champagne flutes, so the kids felt really grown up, but which was fantastic for their family friendly day. Want something fancier for your wedding reception? I love the idea of serving alco-free cocktails, or mocktails. You see this a lot at teen birthday parties but somehow it doesn't often get talked about in a wedding context. Jugs or bottles of theme-named drinks can look fabulous in the design of a wedding breakfast table setting, or on a mocktail bar. You can still mix a mocktail in a fancy way if you want to bring in a cocktail mixing professional. And you know it doesn't matter who drinks what as they're all family friendly. How about something a bit more sophisticated? Offering an Afternoon Tea instead of the traditional wedding breakfast is another great way to introduce an alcohol-free meal without making a big deal out of it. Because it has the air of a little bit of sophistication, guests often approach it in a slightly more 'adult' way. It's easy enough to offer child friendly versions too. Maybe offer a selection of different options of tea and coffee for your adults, with a choice of juice flavours for the kids. But what about my evening reception bar? Alco-free alternatives exist for most things now, with the exception of spirits. If you feel like your guests will want the beer/lager option available then make sure your bar is stocked up with alco-free 0% versions. Offering an open bar (where you cover the cost) could help this and running it yourselves will mean you have total control over what is available. Again I'd recommend having some pre-made mocktail alternatives like virgin mojitos or mock mimosa. Who doesn't like a hot drink on a cold day? Guests will love having a tea/coffee after standing around outside for photos. If you're having a winter wedding and want to offer mulled wine, there's an alcohol-free version of that too. There are other winter wedding options you could try including a hot chocolate station. Perfect for warming up on a chilly night and you can offer lots of 'toppings' to fun it up, like marshmallows, sprinkles, whipped cream or add some spice like ginger or chili.